Mithun Rai, Pramod Madhwaraj peddling ‘soft Hindutva’? However, BJP leaders say the Congress attempts to woo Hindus with such tactics will not succeed. 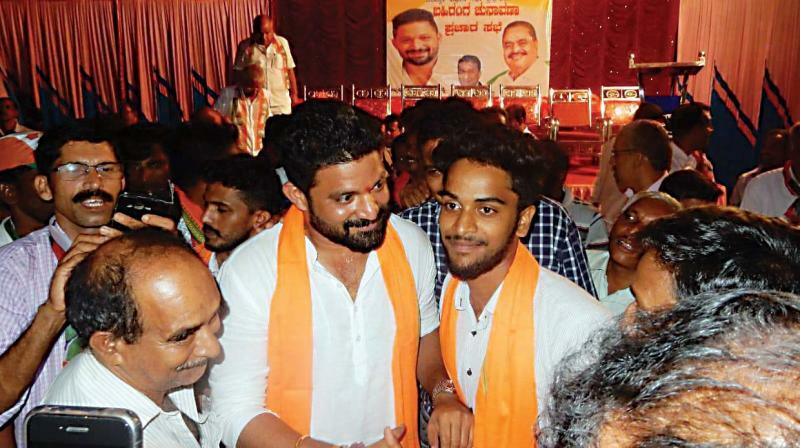 Mangaluru: Congress candidates in the coastal constituencies, including Mithun Rai (Dakshina Kannada) and Pramod Madhwaraj (Udupi-Chikkamagaluru) seem to have picked a cue from their BJP counterparts by peddling a soft Hindutva approach with Rai sporting saffron shawls and Madhwaraj speaking about rearing cattle! If some within the Congress believe this could help in getting the Hindu vote, others aver that that it could alienate the traditional minority vote. Some within the Congress allege that Mithun has a soft corner for workers of Bajrang Dal and other saffron outfits. Social media is abuzz with photos of Mithun wearing a saffron shawl while campaigning in some of the BJP strongholds. “At the national level, the Congress has adopted a soft Hindutva line as they have realised the importance of Hindutva. Congress candidates in Dakshina Kannada and Udupi too are following this line," BJP Mangaluru Vibhag Prabhari Uday Kumar Shetty told Deccan Chronicle. “In DK, Mithun Rai is giving pro Hindutva statements. In Udupi, Pramod is doing the same. Pramod claims he rears cattle. The issue is not about rearing cattle but about supporting those who steal cattle. People won't believe their fake Hindutva,” he said. “Congress is known for its secular stand and many within the party have started saying that it could cost us heavily if we adopt a pro-Hindutva stance against the party's secular policy," a Congress leader said. Karnataka Komu Sauhardha Vedike district president Suresh Bhat feels there is a need to differentiate between Hinduism and Hindutva. "Visiting a temple, Matha or offering prayers or chanting sholkas are part of Hindu culture and so they cannot be dubbed pro-Hindutva," he said. Mr Bhat also felt a soft Hindutva approach is nothing new for the Congress.